As a prelude to the Heart of Virginia Festival and to celebrate our more than 30 years of service to the local community, artists affiliated with Central Virginia Arts are opening their studios to the public from 11 am to 2 pm, on Saturday, April 6. It’s an opportunity to meet the artists, see their work, and ask questions about the creative process. What a great way to spend a Saturday in early spring! Visit the studio of your choice or both. Refreshments will be available. We’re looking forward to seeing you soon. Founded in 1988, Central Virginia Arts Association, a partner of the Virginia Museum of Fine Arts, is a non-profit organization bringing together artists and art appreciators at lectures, workshops, exhibits, tours and socials throughout the year. The CVA serves Appomattox, Buckingham, Charlotte, Cumberland, Lunenburg, Nottoway, and Prince Edward Counties. For more information, visit their website at: www.centralvirginiaarts.org, or email: info@centralvirginiaarts.org. The Central Virginia Arts will be hosting an Artists Reception on Friday, April 5, 2019, from 6 to 8 pm, at the Riverside Café, 501 N. Main, Farmville, VA. There will be three CVA member artists displaying their works during April and May—Sandra Breil, Mary Evlyn Upshaw, and Janet Williams. There will be savories and sweet bites as well as beverages. The public is welcome and the event is free. Sandra Breil taught Biology at Longwood for 29 years and started making art in the seventies. She studied with colleagues at Penland School and Arrowmont. She has worked and exhibited extensively in watercolor and handmade paper. Currently, she is working in fused (kiln fired) glass. She also works and studies at Visual Arts in Richmond and at workshops in North Carolina and Massachusetts. Mary Evlyn Upshaw is a life-long lover of the arts. A resident of Farmville, she graduated from Radford University. In addition to creating art, she is an art counselor, and she loves to attend concerts and theater events. She is an involved community member and loves to share her faith and her art. Janet Williams has enjoyed drawing and other artistic endeavors since she was a small child and has been painting in oils since 1998. 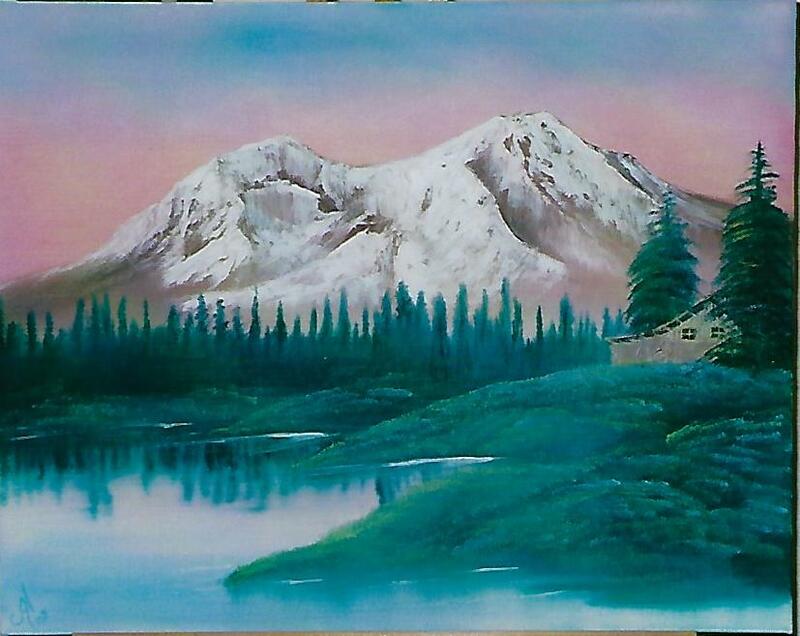 Having completed the Teacher Training Programs at the Bob Ross Studios, where she studied under International Instructors, she is a Bob Ross Certified Instructor. She teaches landscapes, seascapes, florals and wildlife in her Farmville Studio. Central Virginia Arts held an artist reception at the Riverside Café on April 6, 2018. It was well attended, and the art was very well received. The public is welcome to stop by Riverside Cafe during the months of April and May to see this fine show featuring the artworks of Ursula Burgess and Marianne Dennison. Ursula Burgess is an artist who moved from Europe to Nottoway County over 20 years ago. As a native of Germany, the rich history and presence of European art all around her influenced Ursula profoundly. She studied with successful artists and art teachers in Europe and continued in the USA. Ursula is currently working on a series of acrylic paintings inspired by her most recent trip to Toscany. She also loves and teaches watercolors, collages and mixed-media sketches. She keeps her art fresh and current with studies at Longwood University and constant intensive seminars with some of the best artists the US has to offer. Her biggest satisfaction is to pass on her knowledge and enthusiasm in her own community. Ursula Burgess has taught workshops at the Longwood Center for the Visual Arts, The Borrowed Space Gallery in Farmville, the Arts Camp at the Buckingham County Arts Center, Red Door 104 and her Art Studio near Crewe among other places. She was the featured artist in various exhibitions, has been accepted to juried fine art shows and won several awards. She is also the current President of Central Virginia Arts. Marianne Dennison, of Farmville, exhibits drawings and paintings in watermedia, oil, and mixed-media. Her award-winning work, inspired by nature's color, texture, and design, has been shown throughout central Virginia, including Charlottesville and Richmond. Recent awards include first place in mixed-media at the Heart of Virginia Festival and the “grand prize” in the Familiar with Farmville exhibit at Red Door 104. She is an honors graduate of Roanoke College with a degree in English. After studies in graphic design, she worked in public relations as writer, editor, and graphic designer. She also taught in primary school for several years when her children were young. In retirement, she began painting and enrolled in workshops and audited many art courses at Longwood University. 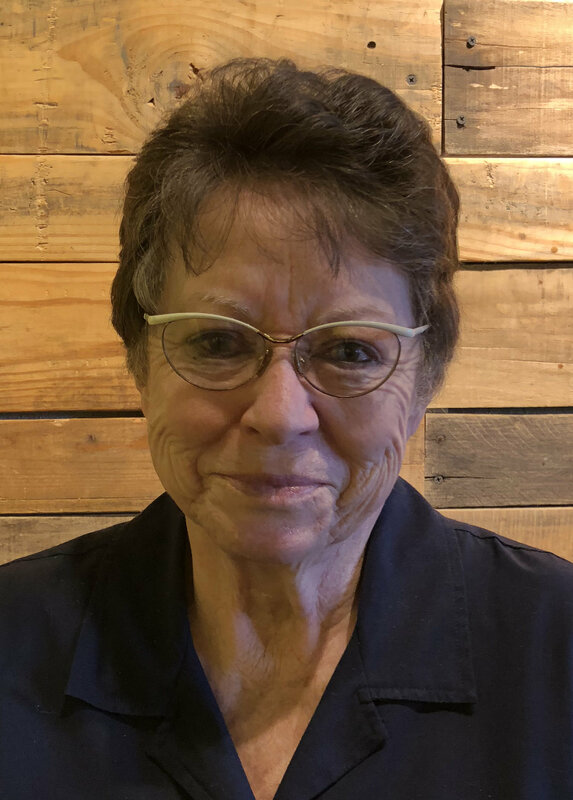 For years she has been a volunteer and officer in regional art organizations and received an Achievement in the Arts award from the Longwood Center for the Visual Arts. She and her husband Tom will celebrate their 53rd anniversary in May. The Central Virginia Arts will be hosting an Artists Reception on Friday, February 2, 2018, from 6 to 8 pm, at the Riverside Café, 801 N. Main, Farmville, VA. There will be three CVA member artists displaying their works during February and March—Phyllis McKinney, Mary Frances Peca, and Janet Williams. There will be savories and sweet bites as well as beverages. The public is welcome and the event is free. As a child Phyllis McKinney always wanted to be an artist. Her elementary school teachers often asked her to draw pictures for boards or displays, and she loved it. She received an Art Education Degree at Hampton University and an Early Childhood Masters Degree from the University of South Carolina. She moved back to this area about a year ago and began painting again after retiring as an educator in Augusta, Georgia. She loves painting realistic arrangements and finding textures and hues deeply hidden when the light hits them. She mainly uses acrylic paint for the brilliance and its quick drying qualities. Mary Frances Peca has been an artist all of her life, although sometimes her art has had to take a backseat to life. She has tried many media, but her true love is oils. She started out painting figurative and still-life pieces, and she graduated to landscape painting. 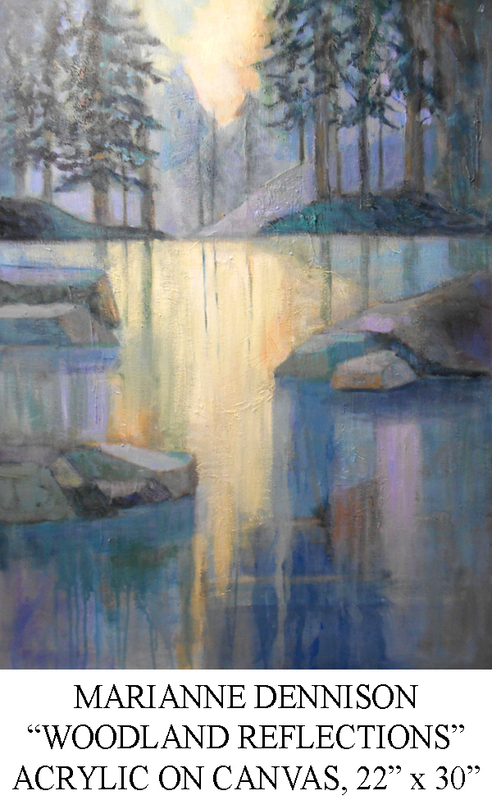 The observation of light, texture, and mood is what she strives for in her artwork. Mary Frances has studied under some well-known artists from the Chicago area such as Sharon Roman, a landscape portrait painter; Charles Vickery, a marina and portraits painter; and Michael McNicholas, an oil and pastel portrait and still-life painter. Mary Frances has taken classes at local colleges and one of the oldest studios in the country in Chicago, Pallets and Chisel. She has studied still-life and figurative works at the school of representational art in Chicago. Recently, she has been taking classes at Longwood University, and she dabbles in photography. Central Virginia Arts is pleased to announce an all-members art show to be held at the MacCallum More Museum & Gardens in Chase City, VA. The art show will hang in the museum from February 10 to March 28, 2018. The public is invited to meet the artists at a reception with food and beverages on February 25, from 3 to 5 pm. Throughout the year the MacCallum More Museum hosts a variety of events and exhibits, but this is the first CVA all-member show. “We are excited about this opportunity for CVA members to display and sell their art in a museum setting outside of the CVA’s geographic area,” said Ursula Burgess, CVA President. “In addition, it is a rare opportunity at a CVA show that we will be able to accommodate three-dimensional art,” she added. There will be space to display up to five pieces of 3D art. Artists are encouraged to take advantage of the opportunity to exhibit their sculptures in this all-media show. To display art in this show, artists need to be a member of the Central Virginia Arts and can join any time. An individual membership is $15 and a family membership is $20. Membership is open to those who appreciate and support the arts. The CVA is sponsoring a Peoples’ Choice Award for the show that will include a $150.00 award for the winner. “Anybody who visits the art show from the opening on February 10 through the reception on February 25 will have an opportunity to vote for their choice of best of show,” said Burgess. A registration form and entry specifications are posted at the CVA website at www.centralvirginiaarts.org. The MacCallum More Museum & Gardens are located at 603 Hudgins St, Chase City, VA 23924. MacCallum More—listed on the National Register of Historic Places and the Virginia Historic Landmarks Registry—is a year-round facility, located on 5 acres of the historical Hudgins property in Chase City. Paths winding by historic treasures collected from around the globe contribute to the unique and serene ambiance of MacCallum More. With a wide variety of eclectic historical figurines, and four unique gardens, MacCallum More has something to pique everyone’s interest. The museum hosts concerts, weddings, art shows, and community events of public interest. You can read more about MacCallum More at www.mmmg.org. The Central Virginia Arts Association, a partner of the Virginia Museum of Fine Arts, is a non-profit organization bringing together artists and art appreciators at lectures, workshops, exhibits, tours and socials throughout the year. The CVA serves Appomattox, Buckingham, Charlotte, Cumberland, Lunenburg, Nottoway, and Prince Edward Counties. For more information, visit www.centralvirginiaarts.org or email info@centralvirginiaarts.org.